Huskies are simply full of personality. She is a loving and docile companion, but she can be independent and willful. With early socialization and consistent leadership, she is a joyful and faithful addition to any family. The Siberian Husky originated in Siberia and was first imported to Alaska in 1909 for use as a sled dog. Original breeding of Huskies by the Chukchi people of northeast Asia focused primarily on dogs with great endurance and tolerance of harsh climates. The Husky is fastidiously clean and has minimal doggie odor. They are a social breed that craves close human contact; due to this social nature, they do not make good watchdogs. Siberian Huskies are intelligent and have a innate desire to work; they are highly active and require vigorous exercise and space to run. Huskies make excellent jogging partners in cool weather! She is not much of a barker, but she is a communal howler especially when bored or under-exercised. The Siberian Husky is a generally healthy breed with an average lifespan of 11-14 years. We know that because you care so much about your dog, you want to take good care of her. That is why we have summarized the health concerns we will be discussing with you over the life of your Husky. By knowing about health concerns specific to Siberian Huskies, we can tailor a preventive health plan to watch for and hopefully prevent some predictable risks. Many diseases and health conditions are genetic, meaning they are related to your pet’s breed. There is a general consensus among canine genetic researchers and veterinary practitioners that the conditions we’ve described herein have a significant rate of incidence and/or impact in this breed. That does not mean your dog will have these problems; it just means that she is more at risk than other dogs. We will describe the most common issues seen in Siberian Huskies to give you an idea of what may come up in her future. Of course, we can’t cover every possibility here, so always check with us if you notice any unusual signs or symptoms. 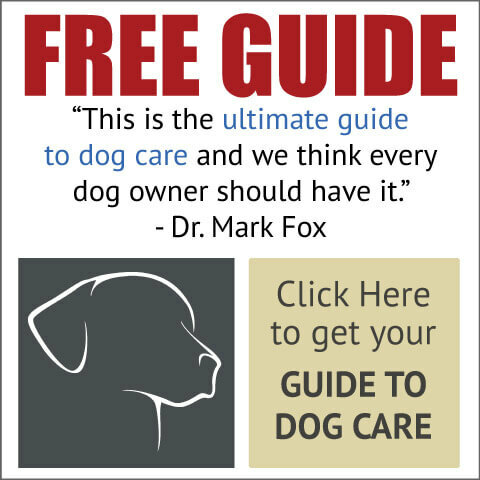 This guide contains general health information important to all canines as well as the most important genetic predispositions for Siberian Huskies. This information helps you and us together plan for your pet’s unique medical needs. At the end of the article, we have also included a description of what you can do at home to keep your Husky looking and feeling her best. You will know what to watch for, and we will all feel better knowing that we’re taking the best possible care of your pal. Dental disease is the most common chronic problem in pets, affecting 80% of all dogs by age two. Unfortunately, your Siberian Husky is more likely than other dogs to have problems with her teeth. Dental disease starts with tartar build-up on the teeth and progresses to infection of the gums and roots of the teeth. If we don’t prevent or treat dental disease, your buddy may lose her teeth and be in danger of damage to her kidneys, liver, heart, and joints. 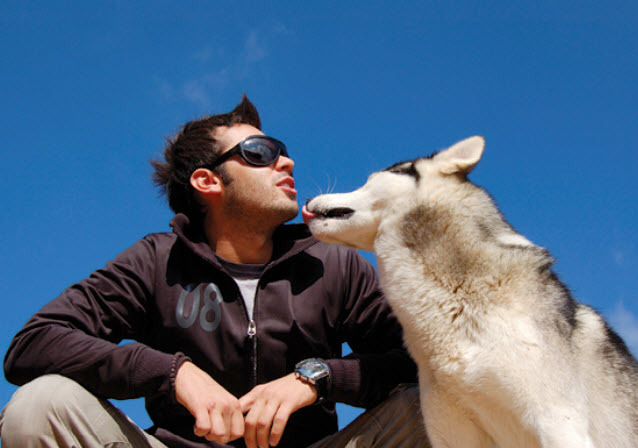 In fact, your Husky's life span may even be cut short by one to three years! We’ll clean your dog’s teeth regularly and let you know what you can do at home to keep those pearly whites clean. Siberian Huskies are susceptible to bacterial and viral infections — the same ones that all dogs can get — such as parvo, rabies, and distemper. Many of these infections are preventable through vaccination, which we will recommend based on her age, the diseases we see in our area, and other factors. Obesity can be a significant health problem in Siberian Huskies. It is a serious disease that may cause or worsen joint problems, metabolic and digestive disorders, back pain, and heart disease. Though it’s tempting to give your pal food when she looks at you with those soulful eyes, you can “love her to death” with leftover people food and doggie treats. Instead, give her a hug, brush her fur or teeth, play a game with her, or perhaps take her for a walk. She’ll feel better, and so will you! 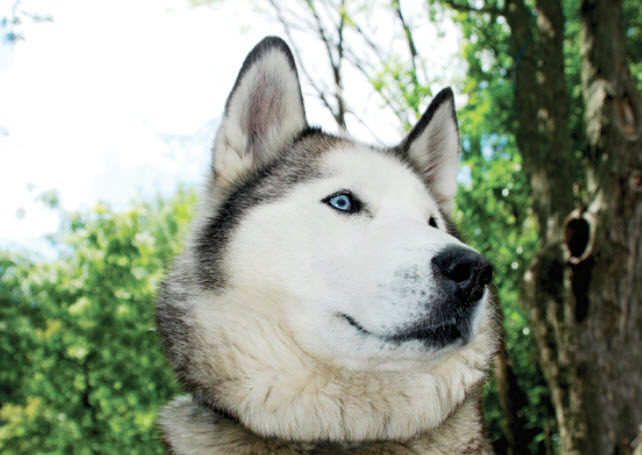 All kinds of worms and bugs can invade your Husky's body, inside and out. Everything from fleas and ticks to ear mites can infest her skin and ears. Hookworms, roundworms, heartworms, and whipworms can get into her system in a number of ways: drinking unclean water, walking on contaminated soil, or being bitten by an infected mosquito. Some of these parasites can be transmitted to you or a family member and are a serious concern for everyone. For your canine friend, these parasites can cause pain, discomfort, and even death, so it’s important that we test for them on a regular basis. We’ll also recommend preventive medication as necessary to keep her healthy. One of the best things you can do for your Husky is to have her spayed (neutered for males). In females, this means we surgically remove the ovaries and usually the uterus, and in males, it means we surgically remove the testicles. Spaying or neutering decreases the likelihood of certain types of cancers and eliminates the possibility of your pet becoming pregnant or fathering unwanted puppies. Performing this surgery also gives us a chance, while your pet is under anesthesia, to identify and address some of the diseases your dog is likely to develop. For example, if your pet needs hip X-rays or a puppy tooth extracted, this would be a good time—it’s more convenient for you and easier on your friend too. Routine blood testing prior to surgery also helps us to identify and take precautions against common problems that increase anesthetic or surgical risk. Don’t worry; we’ll discuss the specific problems we will be looking for when the time arrives. Not many things have as dramatic an impact on your dog's quality of life as the proper functioning of his eyes. Unfortunately, Siberian Huskies can inherit or develop a number of different eye conditions, some of which may cause blindness if not treated right away, and most of which can be extremely painful! We will evaluate his eyes at every examination to look for any signs for concern. Cataracts are a common cause of blindness in older Huskies. We’ll watch for the lenses of his eyes to become more opaque—meaning they look cloudy instead of clear—when we examine him. Many dogs adjust well to losing their vision and get along just fine. Surgery to remove cataracts and restore sight may also be an option. Glaucoma, an eye condition that affects Siberian Huskies and people too, is an extremely painful disease that rapidly leads to blindness if left untreated. Symptoms include squinting, watery eyes, bluing of the cornea (the clear front part of the eye), and redness in the whites of the eyes. Pain is rarely noticed by pet owners though it is frequently there and can be severe. People who have certain types of glaucoma often report it feels like being stabbed in the eye with an ice pick! Yikes! In advanced cases, the eye may look enlarged or swollen like it’s bulging. We’ll perform an annual glaucoma screening to diagnose and start treatment as early as possible. Glaucoma is a medical emergency. If you see symptoms, don’t wait to call us, go to an emergency clinic! Pannus is like a suntan on your dog's eyeball. In affected breeds, inflammatory cells infiltrate the cornea (the clear part of the eye), which then darkens with exposure to ultraviolet light, and may lead to complete blindness. It's considered to have a genetic component, since the condition is predominant in certain breeds, like your Siberian Husky. We'll watch his eyes closely for early signs and start preventive eye medications if needed. Doggie sunglasses are also an option to help reduce sun exposure. There are several types of inherited bleeding disorders that occur in dogs. They range in severity from very mild to very severe. Many times a pet seems normal until a serious injury occurs or surgery is performed, and then severe bleeding can result. Von Willebrand’s disease is a blood clotting disorder frequently found in Siberian Huskies. We’ll conduct diagnostic testing for blood clotting times or a specific DNA blood test for Von Willebrand’s disease and other similar disorders to check for this problem before we perform surgery. Von Willebrand’s disease is a blood clotting disorder frequently found in Siberian Huskies. We’ll conduct diagnostic testing for blood clotting times or a specific DNA blood test for Von Willebrand’s disease and other similar disorders to check for this problem before we perform surgery. There are three types of seizures in dogs: reactive, secondary, and primary. Reactive seizures are caused by the brain's reaction to a metabolic problem like low blood sugar, organ failure, or a toxin. Secondary seizures are the result of a brain tumor, stroke, or trauma. If no other cause can be found, the disease is called primary or idiopathic epilepsy. This problem is often an inherited condition, and Siberian Huskies are commonly afflicted. If your friend is prone to seizures, episodes will usually begin between six months and three years of age. An initial diagnostic workup may help find the cause. Lifelong medication is usually necessary to help keep seizures under control with periodic blood testing required to monitor side effects and efficacy. If your dog has a seizure, carefully prevent him from injuring himself, but don't try to control his mouth or tongue. It won't help him, and he may bite you accidentally! Note the length of the seizure, and call us or an emergency hospital. Huskies may develop a disease called laryngeal paralysis in which the vocal cords become paralyzed and hang down into the airway. The primary symptom is noisy breathing, especially when outside in hot, humid weather or after exercising, but in severe cases, a pet can collapse and have difficulty breathing as well. Treatment may include environment control and medication. Bring your pet in right away if you notice signs of respiratory distress before the problem becomes a surgical emergency! Huskies are more likely than other breeds to have high blood pressure, also called hypertension, which may occur independently or be caused by another disease. High blood pressure can cause blindness and strokes in dogs, just as it can in people. The Rau Animal Hospital medical team will test his blood pressure on a regular basis and prescribe blood pressure medication if needed. 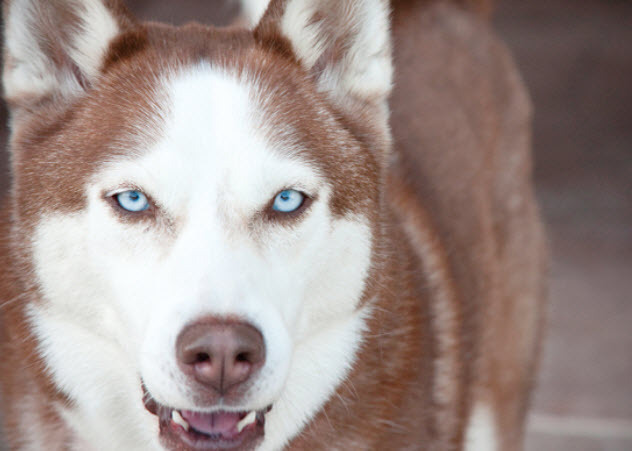 Some breeds, like your Husky, can be born with a variety of heart defects. Most affect the structure of the heart’s dividing wall or the vessels of the heart. Defects can also cause problems with heart valve function or the electrical signals that control the heartbeat. Because of the significant risk of heart disease in this breed, we’ll pay special attention to his heart during each examination. Special testing will be recommended if we hear a heart murmur or if you notice any unusual symptoms such as tiring easily, coughing, a swollen belly, or fainting. Cancer is a leading cause of death in older dogs. Your Husky will likely live longer than many other breeds and therefore is more prone to get cancer in his golden years. Many cancers are curable by surgical removal, and some types are treatable with chemotherapy. Early detection is critical! We’ll perform periodic diagnostic tests and look for lumps and bumps when we examine your pet. You’ve probably heard of hip dysplasia, an inherited disease that causes the hip joints to form improperly and leads to arthritis. Hip dysplasia is common in Siberian Huskies. You may notice that he has lameness in his hind legs or has difficulty getting up from lying down. We’ll take X-rays of your dog’s joints to identify the disease as early as possible, and we can treat the arthritis—the sooner the better—to avoid discomfort and pain. Surgery is sometimes considered in severe and life-limiting cases of hip dysplasia. And keep in mind that overweight dogs may develop arthritis years earlier than those of normal weight, causing undue pain and suffering. Inflammatory bowel disease, or IBD, is an immune system disorder common in Huskies in which the intestinal lining becomes overrun with immune system cells called lymphocytes and plasmacytes. The stomach and/or intestinal lining becomes thickened, affecting his ability to absorb nutrients properly. Chronic vomiting or diarrhea is common, or symptoms may flare up suddenly and then improve again for a time. Stress, diet change, or intestinal parasites can make IBD worse. If your friend has diarrhea or digestive upsets that are not explained by more common reasons, diagnostic tests, which may include intestinal biopsy, will be needed. Lifelong medications and special diets are usually required to keep IBD under control. Degenerative myelopathy is a neurologic condition, similar to ALS or Lou Gehrig's disease in people, that causes weakness and poor nerve function in the hind legs. 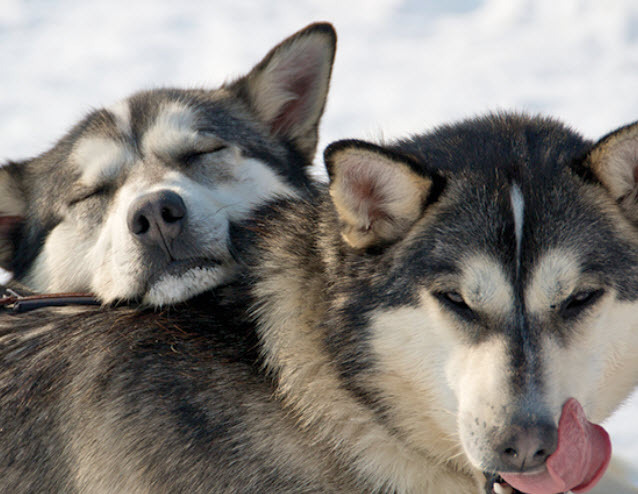 It affects Huskies more frequently than other breeds. If your dog has this disease, he will become increasingly weak and disabled in the hind legs, eventually suffering from paralysis in his hindquarters, which also leads to incontinence. Rehabilitation, exercise, acupuncture, and dietary supplements can be helpful, but there is no cure for degenerative myelopathy. A genetic test is available to determine whether your dog is at risk for this heritable disease. Pemphigus foliaceus is a superficial skin disease that is more common in Siberian Huskies. It often starts around four years of age and causes crusts and hair loss, usually on top of the nose and inside the ear flaps. Some dogs get it on their footpads and toenails as well. Bacteria easily invade the damaged areas, so secondary skin infections are common. Skin crusts typically wax and wane; there is no cure, but there are a variety of effective treatments. Sunlight makes it worse, so applying zinc-free sunscreen to sensitive parts before heading outdoors can help. Uveodermatologic syndrome is a complex disease found more frequently in Siberian Huskies than other breeds. “Uveo” refers to the inside of the eye and “derm” refers to the skin. This condition is an autoimmune disorder in which the immune system attacks the cells that make pigment in the skin and inside the eyes. It can cause pain or blindness in the eyes and can cause the pigmented areas of his nose, lips, and skin to change from dark to light. Sunlight can also worsen the effects this condition. Huskies are prone to a form of skin infection called zinc-responsive dermatosis in which a pet either doesn’t get enough zinc in his diet or his body doesn’t absorb it properly. Signs include red, hairless, crusting, scaling, or oozing skin around the mouth, chin, eyes, or ears, and lesions on the foot pads or nose. If your dog develops this disease, we’ll prescribe a carefully regulated amount of added zinc to his diet. Huskies are prone to a common condition called hypothyroidism in which the body doesn’t make enough thyroid hormone. Signs can include dry skin and coat, hair loss, susceptibility to other skin diseases, weight gain, fearfulness, aggression, and other behavioral changes. We’ll conduct a blood test annually to screen for this disease. Treatment is usually as simple as replacement hormones given in the form of a pill. The ureters are small tubes that allow urine from the kidneys to flow into the bladder where urine is safely stored until the dog decides to urinate. Occasionally in Siberian Huskies, however, one of these tubes forms incorrectly, taking urine past the bladder instead of into the bladder itself. Urine that doesn’t enter the bladder will drip out on its own instead of on command. This condition is called ectopic ureter. The problem can be diagnosed either by x-rays or by an ultrasound of the bladder, and the ureter can be reattached through surgery. Hyperphosphatemia is a condition in which elevated levels of the enzyme alkaline phosphatase, or ALP, are present in the bloodstream. Affected Siberian Huskies usually show no signs of illness, although microscopic examination of their livers may reveal abnormalities within the liver cells. Usually, hyperphosphatemia is not serious and does not require treatment, however, other serious diseases may also cause the ALP enzyme to be elevated, so we’ll want to rule out other problems before diagnosing your pet with this condition. Much of what you can do to keep your dog happy and healthy is common sense, just like it is for people. Watch her diet, make sure she gets plenty of exercise, regularly brush her teeth and coat, and call us or a pet emergency hospital when something seems unusual (see “What to Watch For” below). Be sure to adhere to the schedule of examinations and vaccinations that we recommend for her. This is when we’ll give her the necessary “check-ups” and test for diseases and conditions that are common in Huskies. Another very important step in caring for your pet is signing up for pet health insurance. There will certainly be medical tests and procedures she will need throughout her life and pet health insurance will help you cover those costs. Build her routine care into your schedule to help your Husky live longer, stay healthier, and be happier during her lifetime. We cannot overemphasize the importance of a proper diet and exercise routine. Give her a thorough brushing at least weekly most of the year. Twice a year she blows her coat and loses crazy amounts of hair; daily brushing is recommended during this time. Siberian Huskies generally have good teeth, and you can keep them perfect by brushing them at least twice a week! She has a high prey drive, so she needs to be leash walked and a sturdy fence is a must. Huskies can be affected by snow nose, or a loss of pigment in the nose, making her prone to sunburn. She will need dog-safe (zinc-free) sunscreen. Any abnormal symptom could be a sign of serious disease or it could just be a minor or temporary problem. The important thing is to be able to tell when to seek veterinary help and how urgently. 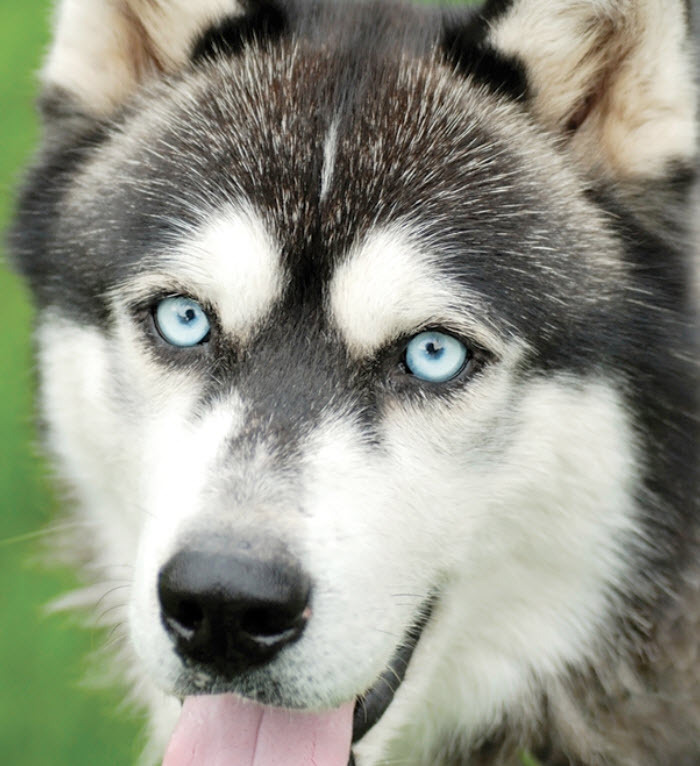 Many diseases cause dogs to have a characteristic combination of symptoms, which together can be a clear signal that your Siberian Husky needs help.